Join performers from Actors' Shakespeare Project and author Conn Iggulden for a trip back to the world of Yorks and Plantagenets. It is 1454, and for over a year King Henry VI has remained all but exiled in Windsor Castle, struck down by his illness, his eyes vacant, his mind a blank. His fiercely loyal wife and queen, Margaret of Anjou, safeguards her husband’s interests, hoping that her son Edward will one day come to know his father. Following on from Stormbird, Margaret of Anjou is the second epic installment in master storyteller Conn Iggulden’s new Wars of the Roses series. Fans of Game of Thrones and The Tudors will be gripped from the word "go." Conn Iggulden is one of the most successful authors of historical fiction writing today. Following Stormbird, Margaret of Anjou is the second book in his superb new series set during the Wars of the Roses, a remarkable period of British history. His previous two series, on Julius Caesar and on the Mongol Khans of Central Asia, describe the founding of the greatest empires of their day and were number-one bestsellers. Iggulden lives in Hertfordshire with his wife and children. 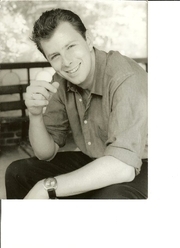 Conn Iggulden will sign and discuss Wars of the Roses: Stormbird (Putnam; $27.95). Conn Iggulden is one of the most successful and critically praised authors of historical fiction writing today, with over seven million copies of his books sold worldwide. His previous two series described the founding of two of the greatest empires in history, ancient Rome and the Mongol empire. A graduate of London University and a former schoolteacher, he lives in Hertfordshire, England, with his wife and children. Despite finding time to write historical novels and The Dangerous Book for Boys, Conn Iggulden is in some ways better known as a trainer of Tollins. His Tollin troupe, "Small and Mighty," are famous in Tasmania, where they often play to packed houses. "It used to be just a hobby," he says, "but when you've seen a display of Tollin synchronized flying, you realize it's your life's work. Also, they can be transported in shoe boxes, so it's pretty cheap to get around." Conn Iggulden's book Wars of the Roses: Stormbird was available from LibraryThing Early Reviewers. Conn Iggulden's book Conqueror was available from LibraryThing Early Reviewers. Conn Iggulden's book Khan: Empire of Silver was available from LibraryThing Early Reviewers. Conn Iggulden is currently considered a "single author." If one or more works are by a distinct, homonymous authors, go ahead and split the author. Conn Iggulden is composed of 9 names. You can examine and separate out names.